Exclusive 8 bedroom Villa with Private pools, Games Room, Cinema, Gym and Sauna. Supremevillas.com is proud to present Casa do Vale, a superb classic-style villa situated in Almancil at the heart of the Algarve's famous 'Golden Triangle'. We realise that since the recession began to take effect there are many more properties being offered for rental, making it even more important to make the right choice. We have been renting in the Algarve since 2003 and have listened to guests' feedback. We have our own dedicated management team to look after your every need during your stay with us. Our 'Villas with a Difference' policy ensures we provide a lot more than just a villa rental! The transfer time from Faro airport is just 20 mins (16km west). The location and flexibility of accommodation cater for all holiday criteria from 'get away from it all' to family holidays to sporting activities and cultural/historic sightseeing holidays. There is something for everyone both young and old. Its central location ensures quick and easy access to all the region's multitude of activities. ALSO AVAILABLE AS 4, 5, 6 or 7 BEDROOMS WITH REDUCED RATES - contact 'Bookings' on 07931 328168 for further details. Air-con is inclusive from late May to late August. In the unlikely event that you require heating/air-con from September to end of May it can be activated at a supplement. New Gym/Fitness suite with punch bag, speed ball, free weights and Life Fitness cardio treadmill, step, x-trainer and bike. Concept 2 model E rower and plenty of free space area for floor work. Coffee maker - capsule type "Caffitaly" system offering a wide selection of coffee types. Reasonably priced capsules available from local supermarket. New Finnish Helo sauna (8 seater) is available from 2017 at a supplement. Casa do Vale has its own private cinema with Bar with digital full HD projector, 110" screen, Blu-Ray/DVD player, and KEF surround sound. It will even upscale ordinary DVDs to higher resolution! This is the ultimate in home entertainment. The Games Room is equipped with American Pool, table tennis, table football, darts, Playstation PS3 and PS4, Nintendo Wii and X-Box Kinect on two 40" LCD TVs. Air-con is inclusive from late May to late August. In the unlikely event that you require heating/air-con from September to end of May it can be activated at a supplement. Free unlimited Wi-Fi. Full fencing with electric gates, security CCTV, video entryphone and monitored alarm system make the property extremely safe and secure for all. A welcome pack with essentials for your arrival is provided with our compliments. Maid service is provided 2 times per week with weekly bed linen and bi-weekly towel change. New from Oct. 2018 - POOL HEATING!!! Outside: The villa has large outdoor shaded terraces for al-fresco dining and provides ideal respite from the sun or may be just the place to enjoy a late evening cocktail and savour the quiet ambience of the Algarve. The fantastic charcoal barbecue will only enhance your holiday experience. The villa boasts a large private pool with night lighting and separate children's pool that are both exposed to full sunlight all day and is set in 3/4 acre landscaped gardens with large lawns. Deluxe sun loungers, parasols, and 'Rattan' leisure outdoor furniture provide the perfect environment to just chill and let the world go by. We had decided that a traditional wedding wasn't really what we wanted so we arranged to get married overseas. We wanted to keep the event intimate but fun .My fiancée had heard from a friend about Case Do Vale so we got in touch. Lesley, the owner, couldn't do enough for us and rather than just the reception at the Villa , we ended up having a civil ceremony on the property. Lesley organised everything from the flowers to the caterers; even the music. She suggested local wines , fruits and delicacies.Simply put, all we had to do was show up for the ceremony. Over all It was a perfect location for a perfect day. Apart from the property itself being simply stunning, the decor , the comfort and elegance of every room has been so well thought out. Even down to the gym!! Our wedding day was a huge success with BOTH sides of the family (and thats a FIRST!). The venue was perfection , the food and decor for the day was exquisite. We couldn't have dreamt a better day. Thank you again Lesley... SUPERSTAR!! What can I say. Felt like royalty for the 2 weeks we were here. Have stayed in other so-called luxury villas with similar prices but this puts them to shame. The owners have really thought about what holidaymakers expect from 5 star facilities and delivered in spades. None of that key-under-the-mat and just get on with it. Full welcome pack and met on arrival but not intrusive - just enough to make us feel special. Always at the end of a phone if we needed any assistance. Safety and security always an issue on holiday but soon put at our ease with all the info we were given. Will book to come back April 2017 for girlie 4 day break when new sauna, gym and treatments room open. Our mixed couples 35-somethings group was looking for a luxurious getaway. It met all our needs. Walking distance of bars and eats and a short drive to Vale do Lobo, an area we know well. Nearest beach is 5 mins drive away and secluded. Fabulous cinema. Outdoor bar with fridge and sounds on the raised terrace above the pool meant no-one had to move too far for refreshments. Would defo come back again. The nearest beach to the villa is the unspoiled coveted EU 'Blue Flag' Praia do Trafal which is a 4 minute drive away with pine forests bordering dunes leading to the golden gently sloping shore and is generally a well-kept secret from most tourists. Other long unbroken stretches of sandy coastline are Quinta do Lago (15 mins)and Praia da Rocha (40 mins). For the more adventurous the Algarve is scattered with secluded coves and lovely beaches just a short drive along the coast from the villa. Faro Airport is just 20 minutes away (22km). Car hire is not essential but is recommended to enhance your holiday experience for easy access to all the attractions that the Algarve has to offer. All distances are from the villa approx. Faro (Algarve capital) 22km airport, shopping centres, nature reserve. Almancil 0.1km a la carte dining. Vilamoura 6km exclusive shopping, bars, restaurants, marina, casino, Roman ruins. Loule 9km - traditional Algarve town, fiestas and events and admin centre. Albufeira 17km old town, cheaper shopping, markets, bazaars. Praia da Rocha 46km. English/Irish food and pubs, nightlife, discos etc. Sagres 86km old fort. Spain 86km. There are 5 restaurants and 3 cafe/bars within walking distance of the villa; the nearest being Don Giovanni's excellent Italian 200m away. All culinary tastes are catered for either a short walk or drive away. Apolonia supermarket is just 1 km away that supplies virtually all English imported goods for those who like a 'home from home' environment. The Algarve is one of the most popular tourist regions in Europe and as such has everything to cater for the holidaymaker abroad. Its beauty of being far less crowded than the Spanish Costas ensures a perfect holiday with over 80 coveted EU 'Blue Flag' status beaches. All major towns such as Faro, Almancil, Quarteira, Albufeira, Loule etc have all amenities such as banks, bureau-de-changes, supermarkets, shops and pharmacies. Zoomarine at Guia (the home of 'Piri-Piri' chicken) offers an interactive 'swim with dolphins' program. 'Slide & Splash' and 'Aquashow' (5 mins drive) are water/theme parks well worth a visit for those with children. Water sports are available at most major beaches. Other sports such as tennis, golf and horseriding are all readily available. The exclusive resorts of Quinta do Lago and Vale de Lobo (homes of the rich and famous!) are the other two corners of the famous 'Golden Triangle'. Almancil therefore boasts of a location that is considered within the finest in the Algarve but at a price that is easier on the pocket. 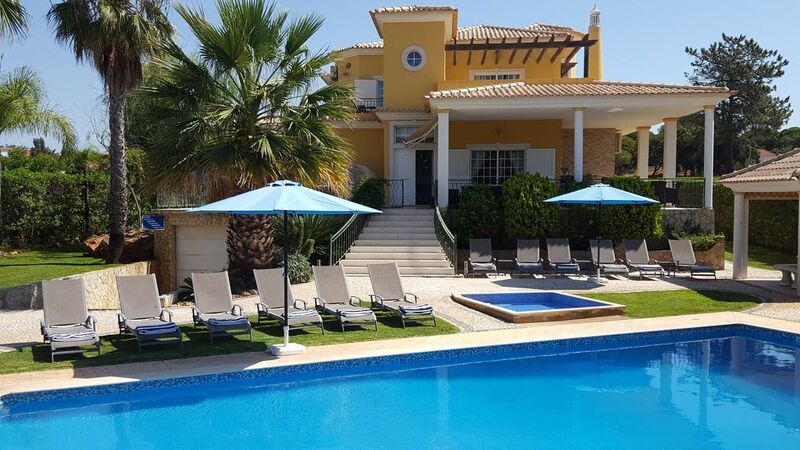 Booking Notes: You can provisionally reserve this villa for your desired dates for just £100 (+ HomeAway Service Fee of approx £14.40) after which you will be issued with a booking form and our Terms and Conditions. At this stage, should you not wish to continue, you can instruct us to authorise a complete refund including the service fee by cancelling the provisional reservation. On acceptance and our receipt of a completed and signed booking form and a cleared 20% deposit of the total rental price in our account you will be issued with a confirmation invoice and your booking will be secured. Subject to a booking confirmation you will be required to pay the balance no later than 8 weeks (56 days) prior to your arrival date. Minimum stay: Winter Sun season - 3 nights, 60% of weekly rate. Spring/Autumn seasons - 4 nights, 70% of weekly rate. Early/High/Late Summer - 7 nights, full rate. UK School half terms - 7 nights, full rate. ** Please note that during High Summer Season (July/August) we are only able to accept bookings of 7 or 14 nights ** Changeover Day: Saturday changeovers are preferred particularly during mid and high seasons, Easter and half-term weeks. In the off-peak season we may be flexible. We request that outgoing guests depart by 10.30am and the incoming party arrive no earlier than 2.30pm. Notes on prices: Prices are per week in UK Pounds (sterling). Our tariffs for next year (2020) are published in September but early bookings for next season can often qualify for this season's rates. Note: Christmas and New Year are subject to High Summer (July and August) season rates.